Are you concerned that not enough of your gadgets are running Android? Well then, we have some good news for you: Nox Audio has decided to show off their latest set of "revolutionary" headphones, the Admiral Touch. 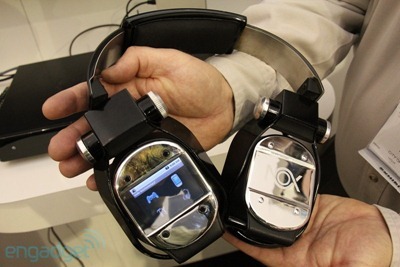 In addition to everything you would expect from a set of wireless headphones (including a retractable mic), they have one particularly interesting feature: they're running Android 2.1 on a 2.4" LCD screen attached to the right cup, powered by an ARM11 processor with 256 MB of RAM. Right now, the screen is only capable of changing the headphones' modes, but with a microSD card slot, USB cord (it uses an eight-pin port as opposed to the standard USB, however), and Bluetooth and Wi-Fi connectivity, we're sure to see some interesting hacks in the future. For those who don't plan on rooting their headphones, by the time of release they will be capable of streaming music from Pandora, as well as chatting through VoIP applications. Skype and MSN chat are listed specifically, but we may see others supported once they are officially released. Although headphones running Android certainly seem farfetched, streaming music without plugging anything in - or depending on another device - is definitely an interesting feature. Now we just have to hope that Android doesn't kill the battery life on them. Read the full press release below. City of Industry, Calif.– Jan. 4, 2011 – NOX Audio is set to unleash an audio revolution with its Admiral and Admiral Touch, the first TruWireless (trademark pending) headsets, scheduled to debut in late 2011. Featuring 7.1-channel surround sound with mobile Bluetooth® and Wi-Fi connectivity, the Admiral and Admiral Touch enable full wireless audio and communication on game consoles for the first time. In addition to these features, the Admiral Touch also will include a 2.4-inch LCD touch screen with gesture control, powered by Google's Android™ operating system – a never-before-seen feature in a headset. 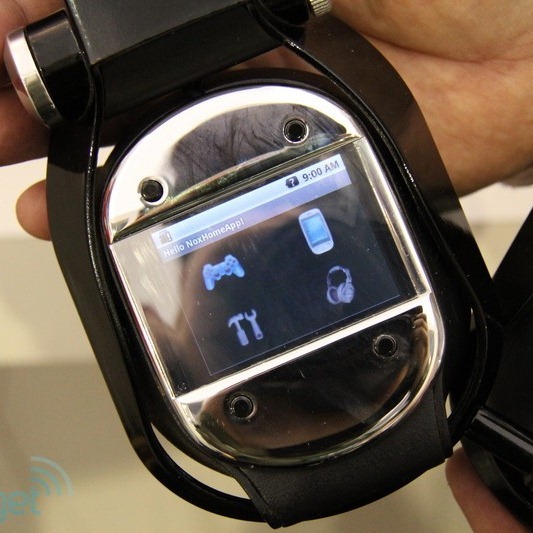 A functional prototype of the Admiral Touch will be unveiled at the 2011 International Consumer Electronics Show (CES) in Las Vegas, Nev., from Jan. 6-9, 2011. Powered by the Android OS, the Admiral Touch takes full advantage of available streaming music including Pandora, and VoIP applications such as MSN chat and Skype, thanks to its built-in Wi-Fi connectivity. With 7.1-channel digital surround sound, the Admiral and Admiral Touch create an immersive experience for playing video games, listening to music and watching movies, as well as crisp, clear audio for phone calls, making it the only truly wireless headset available on the market. Featuring rotating ear-cups that double as a loudspeaker, both headsets will offer maximum versatility and compatibility with PlayStation 3, Xbox 360, PCs, personal music players such as the iPod, home theaters and cell phones and all other electronic devices with a standard 3.5 mm jack and/or any devices with built-in bluetooth. A removable and rechargeable Li-Ion battery provides more than five hours of battery life for optimal usage with any compatible product. "When NOX was developing the Admiral, we considered all available technology to create a truly revolutionary – yet easy-to-use – product that pushes the limits and takes headset listening to a new level, for an attainable price," said Julie Ma, president of NOX Audio. "In addition to giving the Admiral high-quality audio reproduction and 7.1-channel surround sound, we included a 'Touch' version with the functionality of the Android OS to make the headset truly versatile. The Admiral is a product like no other, and CES is the perfect venue for us to introduce it to the public." NOX will unveil a functional prototype of the Admiral Touch at CES 2011 in the North Hall of the Las Vegas Convention Center, booth #5438. The Admiral Touch will be shown by appointment only, in addition to NOX's other products, the Specialist, Negotiator and Scout, which will be available in listening stations on the show floor. NOX also will be hosting DJ Envy, the "Mixtape Master," at CES on Friday, Jan. 7 from 2 p.m. to 4 p.m. PST in the NOX booth. DJ Envy is available for interviews on a first-come, first-serve basis before and after his performances at 2:30 p.m. and 3:30 p.m.